1913 Historic Sheridan Opera House, serves as premiere performing arts venue for the town of Telluride, Colorado. 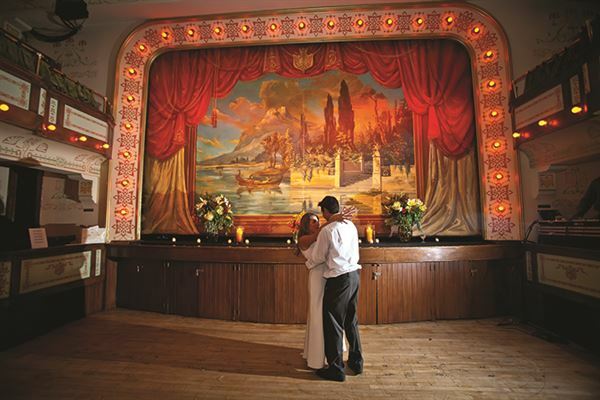 The Sheridan Opera House can be seated for movies screening, speeches, music concerts as well as main floor seats removed for dancing and catered weddings, private parties. The Sheridan Opera House has a stage for a band and produces 30-40 music concerts annually. Please check out the website for further information www.sheridanoperahouse.com. Our first floor includes a box office lobby and a 1,200 square-foot/140 person capacity (64 capacity for seated dinners) bar! The space is perfect for cocktail parties, seated dinners, presentations, dance classes and more. The room is 32 by 39 feet. The second and third floors of the Sheridan Opera House hold the 238 seat historic theater (capacity is 265 with seats out). Our venue includes a balcony with 74 seats (not removable) and 80 capacity for main floor seated dinners with round tables, a movie screen and a professional sound/lighting system.